If there’s one issue that all homeowners should pay attention to, it’s https://homesecuritysystem.co/. Thankfully, this is unlikely to be a lesson that you need hammering home to you -- if you’ll excuse the almost-pun. Given the amount it cost to buy your home, and the extra costs you have incurred to maintain it, it’s unlikely you have left that investment unsecured. Most homeowners will have taken the time to invest in home security -- a wise choice. However, there is still room for error, and those errors are more common than you might think. Below are some of the bad habits that homeowners fall into; even those who think they have their home security needs all wrapped up. Why not browse through and check you’re not guilty of these? So you’ve done the homework. You looked through https://homesecuritysystem.co, considered all your options, then chose an all-singing-all-dancing security system that you felt you could rely on. Your house is safe and secure -- job done! Of course, the job isn’t done -- but too many homeowners feel like that when they have had security systems installed. A security system is only as good as you let it be. If you disconnect it because the cat keeps triggering it or just outright forget to program the alarm before you leave the house, that security system isn’t going to be able to protect you the way it should. If you invest in such a system, then make sure that you actually use it. Electronic security is incredibly useful, but it can also make us all a little bit… lazy. After all, when we’ve got a state-of-the-art security system, why do we need to worry about little details? The electronics can manage it! No, they can’t; so it’s important to try and remain vigilant no matter how good your electronic system is. 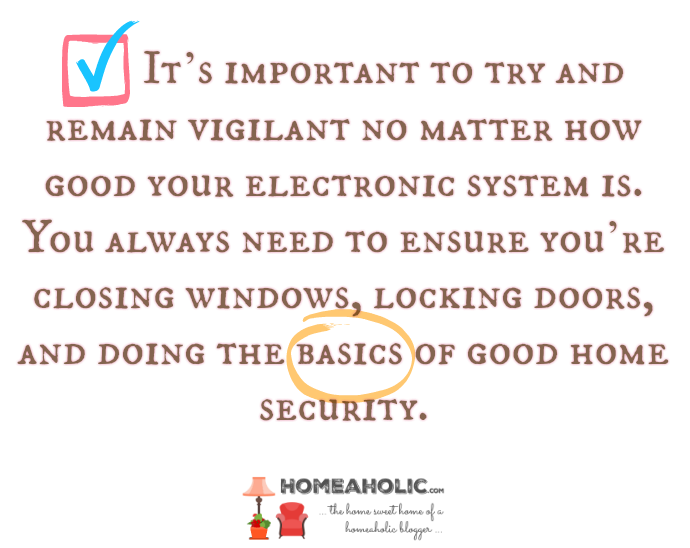 You always need to ensure you’re closing windows, locking doors, and doing the basics of good home security. Burglars think in very specific ways, all of which is focused on finding weakness where a normal person wouldn’t see it. It’s important to take the time to learn how to think like a burglar so you can identify issues with your home. By changing the way you view your home, you can be sure you spot the weaknesses before any opportunistic burglar has the opportunity. It can take awhile to get used to this kind of thinking, but if you manage it, it could have a huge influence on the security choices you make in future -- and how to make the most of the ones you already have. If you have read through the above and are 100 percent confident that you are not guilty of any of these issues, then well done you -- you’re in the minority. If you have identified a few ways in which your home security attitude has been lax, then consider this is a gentle wakeup call, and put measures into place that will keep your home secure for the sake of you and your family.